Three Thursday Markets Left--Eat These While You Can! I hate the end of the Thursday Bellevue Farmers Market because it comes just after the end of summer and presages the end of all Bellevue Farmers Markets whatsoever until 2015. Not to get too dramatic, but there are just THREE Thursday Markets left: Oct 2, Oct 9, and Oct 16. There will still be a goodly amount of Saturday Markets (until before Thanksgiving), but I loved thinking I could buy peaches Thursday and eat them all, since there were more where those came from on Saturday. Lunchbox size, unprocessed, and no artificial anything! How can anyone resist a fruit dubbed "Dapple Dandy," even if it is unfamiliar, as a pluot might be to you. I'm happy to report that, as a lover of both plums and apricots, I'm entirely won over by their pluot offspring. They're pretty, too, which (to paraphrase Jane Austen) a fruit ought likewise to be, if it possibly can. This particular variety is crisp and sweet and juicy. Another perfectly lunchbox-sized fruit. In saucepan, combine potatoes, onion, celery, salt, and 1/2 cup water. Cover; cook 15 minutes or until tender. Stir in corn, milk, herb, bacon, and dash pepper. Heat through. I overbaked them a little. So sue me. Preheat the oven to 400F. Lightly grease an 8x8 or gratin dish. Cut the tomatoes around their equators and dig out the seeds with your finger. In the food processor (or chop by hand), whiz together the garlic, parsley, basil, bread crumbs, salt, and pepper. Fill the tomatoes with this mixture and set them in the dish. Drizzle with olive oil. Bake 30 minutes till soft and browned on top. Do yourself and your family a favor, and cook a real dish with real, seasonal ingredients before they're gone! Those of you who come from families of more than one person know, it can be a difficult thing to prepare a meal that everyone enjoys. In my house we shoot for four out of five--if only one kid thinks it's kind of sick, we are in business. 1. It was a piece of cake to make. 2. It used mostly fresh, local, Market ingredients. The broth is nummy--perfect to blot up with good bread, and the meat just melts. Of course I forgot to take a picture until I'd eaten the last of it the next day. Pretty, and tastes even better! Now here's the trick with the pots: bring one big pot of water to a boil. Throw in the two ears of corn and cook for ONLY TWO MINUTES. Take them out with tongs and throw in the green beans. Cook the green beans until crisp-tender, anywhere from 4-6 minutes, and fish them out with a slotted spoon. In the still-boiling water, pour in your orzo for the Beef Vegetable Soup and cook according to package directions. One pot of water, three things cooked, minimal clean-up! After the vegetables are cooked, combine all ingredients and toss. This is the only salad my girls have ever asked for seconds of, and I plan on buying more corn so we can have it again before the season ends. Everything has to be fresh, fresh, fresh for the full effect. Fresh mozzarella from Samish Bay would be delicious in this, or their Queso Fresco. Tieton's feta could also work, if you wanted a tangy contrast to the sweet corn. 1. For fans of the crinkly variety of spinach, I found it at Hedlin! More crunch, less furry-teeth-sensation. 2. And, if you've missed the usual Asian pear harvest from Rockridge Orchards, I stumbled upon some at Tiny's Organic. There you have it! See you all at the Market this week. 'Tis the season of cheap corn in the stores, and for the past week I've had corn on the brain. Is it worth it, to buy organic from the Market's small farmers, supposing the taste to be equal? Then there's sweet corn, the kind we eat off the cob, canned, or in the frozen food section, Washington State is the #1 producer in the U.S. In both cases, here's why my family has gone organic where possible. 1. Most (90% of) field corn and up to 40% of sweet corn is genetically-modified to resist Roundup and produce its own insect toxin. It used to be that field corn was the stuff you had to be wary of, and sweet corn was fine, but Monsanto's recent push into sweet corn seeds has been changing the picture. I wonder how long sweet corn can stay on the Environmental Working Group's "Clean 15." It would be a shame to see Washington's wonderful farmland go the way of Iowa and the rest of the Midwest. 2. Corn monoculture is an environmental killer. I'm talking about those fields and fields of corn. 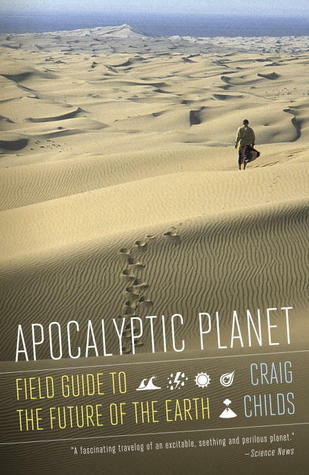 I recently read/skimmed Apocalyptic Planet by Craig Childs because I love disaster books, and one of his chapters of planetary disaster was based on the days he and a friend spent out in an Iowa cornfield, where he meditated on species extinction (there were no plants or wildlife to speak of out there, besides corn), the dangers of the favored pesticide atrazine, the rise in genetically-resistant pests, and the plummeting Monarch butterfly populations. Bad stuff, and another reason to buy corn from our small, diversified, local farms. 3. Cheap conventional corn has wrought havoc on Mexico's economy. Because our conventional corn is subsidized, we can sell it to the world at rock-bottom prices. Problem #1: some of their farmers go out of business and have to go looking elsewhere for work, legally or illegally. Problem #2: when our corn prices rise because of drought or diversion to ethanol production, everyone feels the pain. 4. Corn ethanol requires 29 percent more energy to produce than the fuel generates. I know, this post is supposed to be about the corn we eat, but I had to throw this in because I HATE ethanol. It's environmentally inefficient and lowers gas mileage, to boot. 5. Our Market farmers grow non-GMO, organic varieties that let you bypass reasons 1-4. Try Alvarez Organic's "Rambunction Yellow" corn, grown in Mabton, Washington, over the mountains. Or Hedlin Farms' "Sheba," which Kai describes as super sweet. He says Sheba is actually an early variety, but it comes on later in Western Washington. A perfect ear of "Rambunctious Yellow"
Boil or grill some up this week, or, if you're over beating up on Paula Deen, try her recipe for Corn, Avocado, and Tomato Salad. Everything but the avocado can be had at our Market! Plenty of delightful finds at our Market in late summer, and this week I share a random smattering with you. 1. Still plenty of berries. Buy and freeze now, or forever hold your peace. Although we've already put up blueberry and peach pies in the freezer, I still bought a half-flat of blueberries for quick snacking and this tasty coffee cake. 3. Skagit River Ranch is talking turkey. Yep, it's time to reserve your Thanksgiving turkey. Come by and leave your info and downpayment. I can vouch for the deliciousness of these turkeys, and if you've followed this blog, you'll know that I made 13 meals out of last year's bird! More on that this year, but I hope you'll join me in the Lucky Thirteen Thanksgiving Challenge. 4. Apples, Pears, and Asian Pears are in! Fresh, crisp and luscious. The Asian pears, in particular, are the perfect size for the lunchbox. They look like oversized Rainier cherries, and just picture the interesting pico de gallo they'll make! Zucchini is tasty on the grill with olive oil, salt, and pepper. Or do lengthwise slices in the oven, sprinkled with olive oil and parmesan cheese. 7. You might have realized by now that sampling things at the Market can be hazardous to your waistline and wallet. We were lured in by fellow Marketgoers to Golden Glen Creamery's booth to try the Dill and Garlic Curds. The rest is history. Don't say I didn't warn you. 8. Speaking of Golden Glen, they've added new varieties of their butters, including "Northwest Mushroom Trio" and "Cilantro-Lime," along with tried-and-true flavors like "Cinnamon Spice" and "Honey." If you love store-bought garlic bread, try GG's garlic butter spread over a Market baguette. You may never go back again! 9. There's been fuss over the recent Stanford study which found organic food wasn't appreciably "healthier" than non-organic, but, as everyone was quick to point out, nutrient level varies wildly from fruit to fruit and vegetable to vegetable, depending on the soil conditions, time-to-market, weather, and farming method. One wonderful thing about the Market is that you can meet your farmer, ask about his or her soil and farming philosophy. Talk pesticides, conventional and organic. Food doesn't have to be a mystery at the Market. And, 10. We've got new prepared foods! Have you tried the hot dogs at Saturday's Hot Dog Girl stand? Or the original juice blends at the Juice Box? I love how our prepared food vendors, from Crepes to jam-makers, take advantage of what's in season to whip up special offerings. Don't miss out this week, and come hungry! For a brief, bountiful moment, we are swimming in strawberries. Real strawberries. Meaning, ones with sweetness and flavor that require no added sugar when sliced over ice cream. I treated myself to these Seascape Berries at Willie Green's because I personally subscribe to the smaller-is-better philosophy when it comes to strawberries and blueberries, and the Seascapes were tiny. I was not disappointed. "Sugar bombs," we call them at our house. So ripe we are obligated to eat them the day of. As I mentioned last week, I've been reading a book about the horrors of commercially-grown tomatoes, which I'll eventually cover in a detailed review, but in the meantime, author Barry Estabrook argues that the "focus on making the [commercially-bred] tomato bigger and firmer" has come at the cost of flavor. "They've essentially taken the package and added water. Strawberries are the same story, but tomatoes are probably the worst example" (p. 149). The strawberry mention caught my eye because I couldn't agree more. Several years ago, when the Washington State strawberry crop was hit hard, I was horrified to find California commercial strawberries being served up at the Bellevue Strawberry Festival. Over-sized, hard, flavorless, and tart, conventionally-grown California strawberries are not a reason to celebrate. Especially when you consider those unappealing Frankenberries consistently make the "Dirty Dozen" list of pesticide-laden produce. To my nine-year-old's dismay, our family goes without fresh strawberries until we can have the real thing, locally and seasonally. Ask our farmers about varieties and whether their berries are grown spray-free! Besides being delicious, our local Market strawberries are also geographically educational. I asked Kai at Hedlin Family Farms why Shuksan strawberries were called Shuksan strawberries. Oh, *that* Mt. Shuksan. Not exactly Mt. Baker. UFJ: I never heard of it! I think one of these is not like the other. Kai: Have you ever climbed it? UFJ: Maybe it's because I'm from California. Other Customer: I've never heard of Mount Shuksan either. Sure enough, when I asked Market Director Lori Taylor if she'd ever heard of Mt. Shuksan, she looked at me like I'd asked her if she ever heard of Issaquah. "Of course I know Mt. Shuksan! You Californians!" 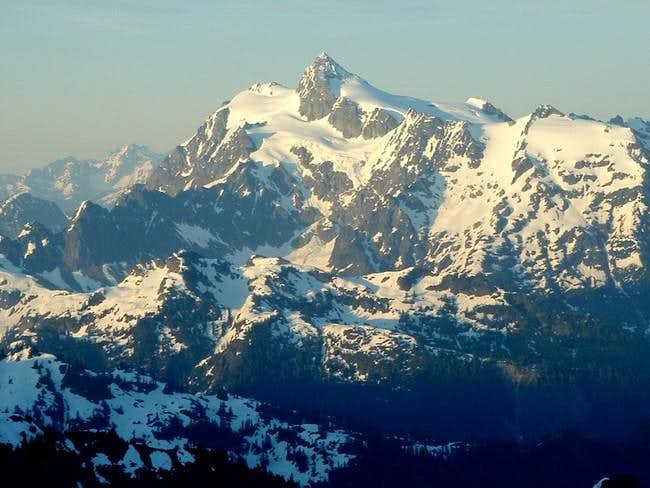 In my defense, my husband, born and raised a Washingtonian, went totally blank over this supposedly-famous, strawberry-inspiring mountain: "Hood, Rainier, and Shuksan? It's not exactly Mt. Baker!" I guess "Baker Strawberries" didn't have quite the same ring. And Not-Exactly-Mt-Baker Strawberries also got the big Veto somewhere along the line. In any case, we can all agree the variety is delicious and worth grabbing over the next couple weeks, along with the fleeting Rainier and Titan cherries. Set them individually (not touching) on a cookie sheet in the freezer. When frozen, pick them off and put them in a freezer bag. Ready for use, the rest of the year 'round. See you this Thursday and Saturday, rain or shine. And grab those half-flats while you can! Yes, indeedy. Clouds and gloom notwithstanding, we know summer is nearly upon us by the fruits beginning to roll in. Last week I picked up this tasty, earliest cherry variety from Robbie at Collins Family Orchard of Selah, Washington. He expects the first Rainiers this week and his personal favorites, Titans, in early July. For those not quite ready to let go of the fall-winter feeling, Robbie has plenty of Pink Lady apples which still crunch satisfyingly. Strawberries appeared in greater number, provided by Youngquist Farms, Hayton Farms, and Alm Hill. My pint container lasted exactly five minutes once I got home, so it looks like a half-flat will be in order this week. In the vegetable department, the perfect sugar snap peas continue. We eat these raw with our Homemade Ranch Dressing, steamed with sesame oil, or added to stir-fries. And Kai at Hedlin Farms was selling little bags of baby artichokes last week! If they're still there this week I plan to get some, having run home to consult my favorite vegetarian cookbook, Deborah Madison's Vegetarian Cooking for Everyone. She suggests a simple Baby-Artichoke-and-Scallion Saute, a recipe this blogger did a post on. For those of you who eat your way through the Market, I made my first visit of the season to Crepes and sampled their seasonal savory bestseller, the Copper River Salmon Crepe with Caramelized Onions and Creme Fraiche. Uh huh. (Only around for another week or two!) And washed it all down with their "mojito-style sweet tea," a minty-citrusy, refreshing concoction that Marketgoers swig rain or shine. If sweets are more your thing, Crepes' bestselling sweet offering is the Salted Caramel with Bananas, Almonds & Whipped Cream. Not that the crepe stopped me from swinging by The Box again. I wanted to try the Mini Bagel Burger that I couldn't get my kids to order last week. De-li-cious. And at its modest slider size and price, you still have plenty of stomach and wallet to head over to the next stand. With all the wonders of the new Market season, I haven't been able to keep you up to date on the latest food-horror books I've been reading, but I'll have a doozy for you soon. It's Barry Estabrook's Tomatoland, and, suffice to say, when my family is on the East Coast this fall for a little vacation, I'm not letting anyone eat the Florida-grown tomatoes. Be thankful we're on the West Coast, and we have lovely tomato options. Speaking of lovely tomato options, Tina at Big Spoon Jam recommended her Golden Tomato & Citrus Marmalade when I asked what would be great on cheese and crackers to serve at book club. She was right. Piquant and very tasty. Tina says it's also her most local current offering, having been torturously and lovingly made with all those teeny, fiddly, local golden tomatoes. So get thee to the Market this week! Pick up some old favorites and try something new. If you were at the Market last week, you noticed the appearance of a new prepared-food vendor, The Box: Asian Fusion Cuisine. Owner and chef Reis Llaneza has garnered press in Kirkland, where he tootles around various locations, serving up his delicious takes on street food. The Bellevue Farmers Market is fortunate enough to be The Box's only farmers market stop! Consider the Pork Belly Hum Bao and Kahlua Pork Hum Bao the kids and I sampled--perfectly cooked and seasoned tender meat nestled in a steamed white bao (familiar to all Chinese food "Peking Duck" and char siu bao lovers), garnished with the crunch of diced and shredded vegetables. My children literally fought over them (for the sake of peace, I did not get the entire one-third of each hum bao I was legally entitled to) and devoured them, vegetable garnish and all. If you knew my son, you would know that a snack tasty enough to make him overlook the presence of vegetables is a tasty snack indeed. Reis prices the hum baos like sliders--cheap enough to have a couple. He also offers a Chop Chop Salad I found several people at the Market eating, and the day's vegan option was a Guajillo Pepper Chili. For those non-vegetarians in search of a meal-size offering, Reis recommended the Chicken Karaage Plate, designed like a bento box with "tender pieces of fried chicken served with a house sauce, steamed rice, and side of Chop Chop Salad." We didn't make it far from The Box--about ten steps to the Molly Moon truck, in fact--before I ran into Leslie, a fellow mom from my children's elementary school, who was carrying a box of tomato starts, all sorts I'd never heard of that she'd found at Hedlin Farms. Following her lead, I swung by and picked up a variety called "Stump of the World," which, according to the gals at Hedlin, yields a "bushy plant with Brandywine pink fruit as big as your head." In other words, stake this puppy well. My husband is not the World's Biggest Rhubarb Fan, having eaten too much of it in every way, shape and form, growing up in Eastern Washington, but the stalks were so very beautiful that I couldn't resist buying a Whole Lot of Them. A whole, whole lot. Since strawberries aren't in season yet, Strawberry-Rhubarb Pie was out, but I did find this recipe for the admittedly-nasty sounding "Stewed Rhubarb." Because it contains strawberry jam, you get some of the same flavor as the pie, and I (at least) found it luscious over vanilla ice cream, as did some friends we had dinner with. Better yet, instead of the recipe being "easy as pie," it was way easier. Give it a try. Serve warm or refrigerate. Spoon over vanilla ice cream. Or split a biscuit, pour over, and top with whipped or ice cream for a Rhubarb Shortcake! What will you discover this week at the Market? And don't forget--if you miss Thursday, the Saturday Market opens this week! 10-3P in the First Congregational Church parking lot, 752 108th Ave NE. Double Markets--yippee! Last Saturday Market, while picking up perfectly enormous celery at Hedlin Farms, I got into an interesting discussion with a woman who was buying eggplant. She was raving about the "Weeknight Curry" recipe she tried from a new cookbook entitled Super Natural Every Day by Heidi Swanson. Apparently there were so many holds on the book at the library that she took the plunge and bought the book, all untested. Everything she had tried so far was delicious, original and garnered rave reviews--even her father, who "hated soup" loved Heidi Swanson's green lentil soup. And what did she plan to do with the darling little eggplants from Hedlin? Try Heidi Swanson's "Pomegranate-Glazed Eggplant with Tempeh," of course. Always on the lookout for a silver bullet, I was sorry to hear the recipes admittedly did not win over her picky-eater son (the other son liked some of the offerings), but I nevertheless did put the book on hold at the library and do a little cyber-stalking of Heidi Swanson. I'm happy to report she has a lovely blog which probably everyone on the planet has already heard about because it's won lots of awards and such, but it was new to me. I especially appreciated the recipe archives, where you can search by ingredient. No idea what to do with that kale you bought at the Market? Hit Heidi up! She covers it all, from cilantro to spinach, lentils to lilikoi. As she describes them, her recipes are "flexible." If you don't have the exact ingredients, substitute ones you do have--perfect if you try to cook according to the seasons and what's available at our Market. Asparagus might give way to green beans or zucchini to cauliflower. No harm done. Cookbook aficionados probably already know that what some people claim to cook "every day"--what they whip up in the kitchen after a long day at the office--doesn't always tally with what the more-beleaguered of us feel up to, come five-thirty. I'm still waiting for someone to put out the Compromise Cookbook--not all from scratch (no, Heidi, I cannot mix and grind my own curry powder tonight! ), but not all from cans and boxes. When I find myself serving a compromise meal, such as offered below, I try to accompany it with something "pure," like simple sliced fruit or cucumber slices dashed in seasoned vinegar. In fact, that is exactly tonight's menu. Throw it all together, except for the garnishes, and leave it in the slow cooker on LOW for a few hours. Or do it on the stovetop: bring to a boil, reduce heat to LOW, and simmer for 10 minutes. Serve with garnishes. New Things at the Market! Wonderful, wonderful, to find ourselves at the start of another Market season! And although I could only grab half an hour between kids' sports and another kid's pick-up time, it was a half-hour well-spent. Hedlin Farms had whole wheat flour for sale. 2 lbs for $4 or 5 lbs for $9.25. Can't wait to try this, especially since I've discovered my kids will eat biscuits made with a mix of graham and whole-wheat flour. Kai also had brussels sprouts plant starts and says they grow pretty well here. Itala of Willie Green's recommends pulsing some baby bok choy into your smoothies (!). A favorite combo of hers: frozen raspberries, baby bok choy, apple or pear, and fresh ginger. Somehow I see my children hesitating over this one, but I'm game to try. Speaking of samples, we also hit up new House of the Sun "raw organic vegan cuisine." If you haven't worked up the energy to make your own kale chips, give theirs a try. Delish. Light and crunchy and perfectly seasoned. House makes entrees and sides and desserts. Have no idea what the "Incan-Goji Torte" tastes like, but it looks very tempting. Not only do they sell at the Market, but they also offer a raw food delivery service to home or office. Check out www.houseofthesunrawfood.com for more information. Finally, Philip Lee of mobile bookstore Readers to Eaters had a great table set up, including many books I've read and written about for this blog. He carries cookbooks, children's books, foodie-type memoirs. Good stuff. If you've got children's birthday parties up the ying-yang this time of year, think what a great gift a picture book and a food item would make. My second-grader, for example, got wildly excited by all the "baby" vegetables, with Willie Green's baby turnips sending her into squeals of delight. Move over, stuffed animals! If you didn't make it opening day, plan on coming by this Thursday.  Parking lot of the First Presbyterian Church of Bellevue (1717 Bellevue Way NE) from 3-7 p.m. The forecast is for sunshine! Last Market of the Season! It's that time, folks. Time not only to pull out all the food stops for Thanksgiving, but also to stock up for the long, Market-less winter. Tiny's Organic had a helpful retweet this week on market produce that will keep and how to keep it, from old standbys like squash and potatoes to cabbage and cauliflower! On my to-do list this week: make homemade rolls to stick in the freezer and fresh cranberry sauce. (Have to--ick!--buy a can as well, for my stepfather, 'cause it ain't cranberry sauce unless it has rings in the side and can be sliced.) Other than those items, I hope to eat local this Thanksgiving. Have you taken the Pledge yet? Puget Sound Fresh has aimed really low, and only asks that you purchase one teensy item locally, so with my Skagit River Ranch turkey, I'm already good to go. The brussels sprouts and potatoes I buy this Saturday are pure frosting. As are any pie pumpkins from Hedlin Farms. My other tidbit was an appetizer I invented. Usually I'm a recipe modifier, but this one is my own brainstorm: Ladysmith Cheese with Slivered Prunes. Uh huh. Take one slice of Samish Bay's Ladysmith cheese (plain or flavored) and top it with a sliver of those canned pitted prunes. Mmmmm...Getting your fiber never tasted so good. Cracker optional. Happy Thanksgiving to all! Starting next week, the UrbanFarmJunkie goes into off-season mode, meaning I'll be bringing you the latest nutrition and food news I've garnered from trolling cyberspace. Stay tuned. 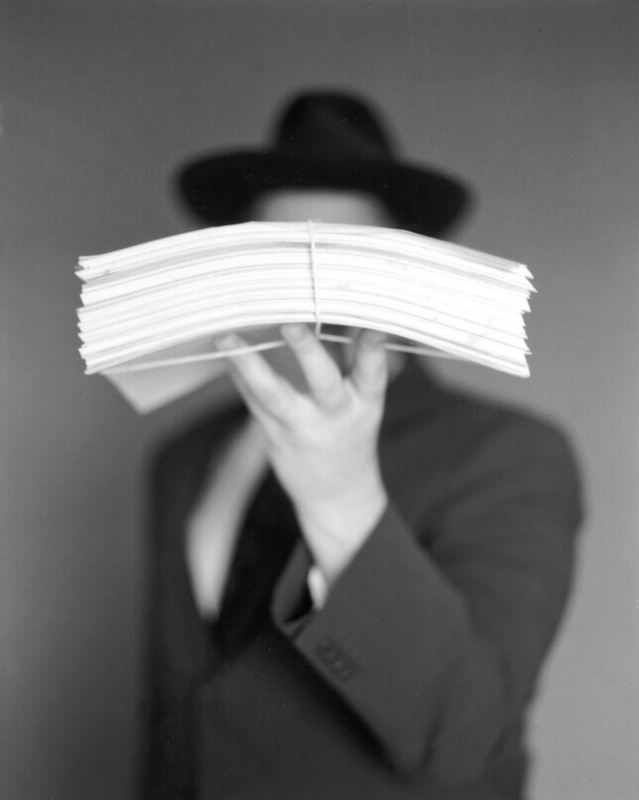 This picture reminds me of the About the Author photos in Lemony Snicket's Series of Unfortunate Events books--elusive, mysterious. These girls have nothing to hide, but when a stalk of celery is this huge, it has a way of taking over the frame. I found this puppy at Hedlin Farms. And let me tell you--celery this big makes a lot of Ants on a Log. Not to mention soup base, which is more what I had in mind. All of which is to say, there's still plenty of good food to be found at our Saturday Bellevue Farmers Market, and lots of it. 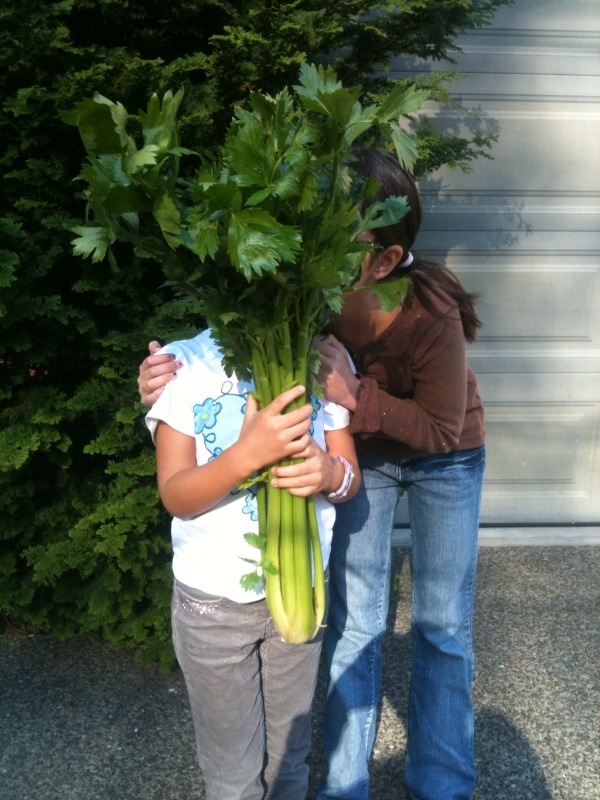 Last weekend I picked up Asian pears, apples, salmon jerky, eggs, green beans, apple cider, danishes, and--yes--giant mutant celery. For a birthday party on Friday I'm coming prepared with my Jonboy caramels, loath as I am to part with them. Keep the Market in mind for any Halloween parties. I've seen pumpkins--both for carving and for cooking into pies--caramel sauce, and even some bitty-sized apples from Tiny's Organic for you old-fashioned types that still remember how to bob for them. And for the night when you're not cooking, don't forget it's Seattle Restaurant Week! If you've been a fan of chef demos at the Market, you'll be glad to know several of their restaurants are participating in the fixed-price extravaganza. 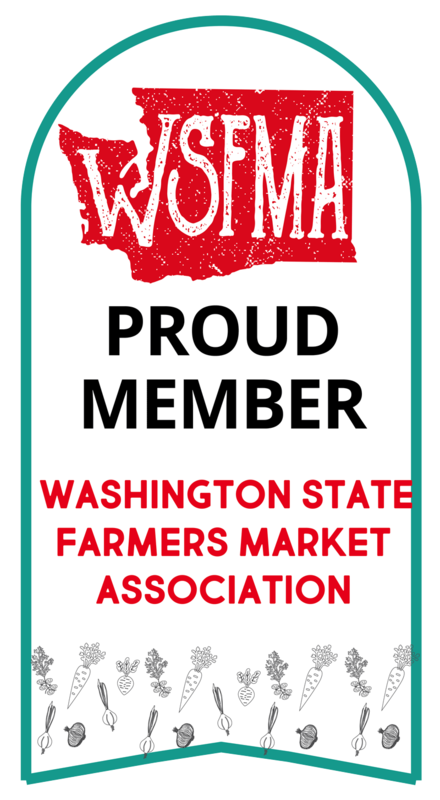 Check out emmer&rye or Monsoon East or Seastar and let them know you appreciate them supporting local farmers! It was with guilt I sent my children running through the pouring rain this morning to their respective school bus stops. Maybe I should be homeschooling them, so they could huddle at home on icky days, wearing their sweats. Not that I would know anything about that. The only problem is that I don't have it in me to homeschool, so their education would go out the window. Is it better to be comfy and dry, or literate? Well, better than either option is to be well-fed. Therefore, rather than wrestle with such weighty issues, let me distract you from the soggy gloom with good news about our food providers at the Bellevue Farmers Market. First off, Samish Bay recently competed in the American Cheese Society's annual competition at Seattle's Benaroya Hall, and--drumroll, please--took home a boatload of awards! Congratulations to Samish Bay! Today for lunch I'm making myself a sandwich with roast beef, Ladysmith with Chives, and cucumber. And for breakfast I had their Greek Yogurt, to which I added BFM's Sweet as Can Bee Honey, Hedlin Farms blueberries, and homemade granola. Delish. In other good news, Loki Fish reports a banner year for the Frasier River salmon run. This tasty variety rivals King for oil-content but is slightly leaner. Get Frasier River salmon fresh now. Loki also has fresh King salmon from Pt. Roberts, Washington, and frozen Keta. Remember: buy 10 lbs and get 10% off! And my last tidbit: the first apples of the season are in. This is the lovely part of the year where peaches and pluots and berries and apples overlap. Could it get any better? I snapped up some Gingergolds, but once my children tasted them I realized I didn't get enough. This Thursday and Saturday I plan to remedy that. Swing by the Market this week, whatever the weather, and enjoy the bounty of our award-winning farmers and producers!